Researchers around the world have demonstrated that grafting can protect plants against a variety of soil-borne diseases in various climates and conditions. Grafting has been successfully implemented in many countries to battle diseases such as Verticillium and Fusarium wilt, corky root rot and bacterial wilt, among others. 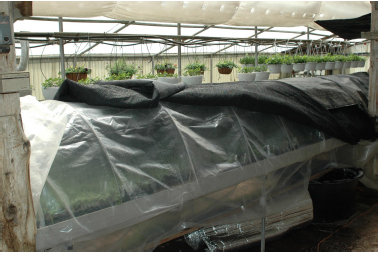 Along with maintaining high fruit quality, tomato grafting can also help overcome abiotic stressors, such as high salinity, excess moisture and soil temperature extremes, even allowing the extension of the growing season. Want more information? See the related SARE grant(s) GS05-046, Inducing Disease Resistance and Increased Production in Organic Heirloom Tomato Production Through Grafting, GS07-060, Potential of grafting to improve nutrient management of heirloom tomatoes on organic farms, LS06-193, Grafting Rootstocks onto Heirloom and Locally Adapted Tomato Selections to Confer Resistance to Root-knot Nematodes and other Soil Borne Diseases and to Increase Nutrient Uptake Efficiency in an Intensive Farming System for Market Gardeners, and OS09-046, Grafting Heirloom Tomatoes on Disease Resistant Rootstock in Western North Carolina.